This layout is a collage of my boys. There are a few photos of each of my boys, from when they were babies up to (almost) now. I wanted to give this layout a feeling of time passing by, so I used a paper from the TIME collection that I designed. The paper has the word time on it and a pattern of clocks. I stamped a few cog wheels and added word accents with time phrases on them. I wanted the title to reflect the theme of the layout so I used a technique called themed title. This idea of this technique is to create a title that will not just be a word related to the subject of the layout, but the design of the title itself would be created with materials, images and embellishments related to the overall theme. 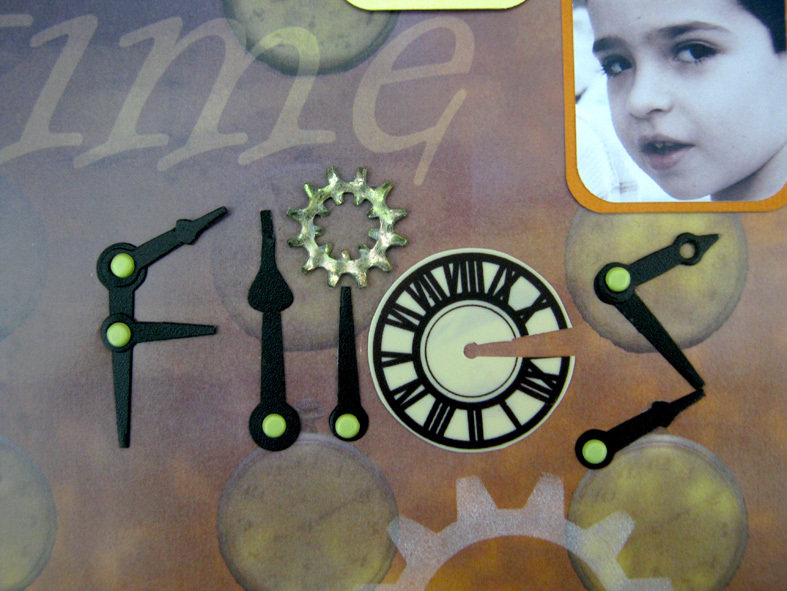 Since the theme of my layout was time, I spelled the word flies from clock parts just below the word time. 1. Build the letters F, L, I, S from clock hands and attach them to the paper with brads. 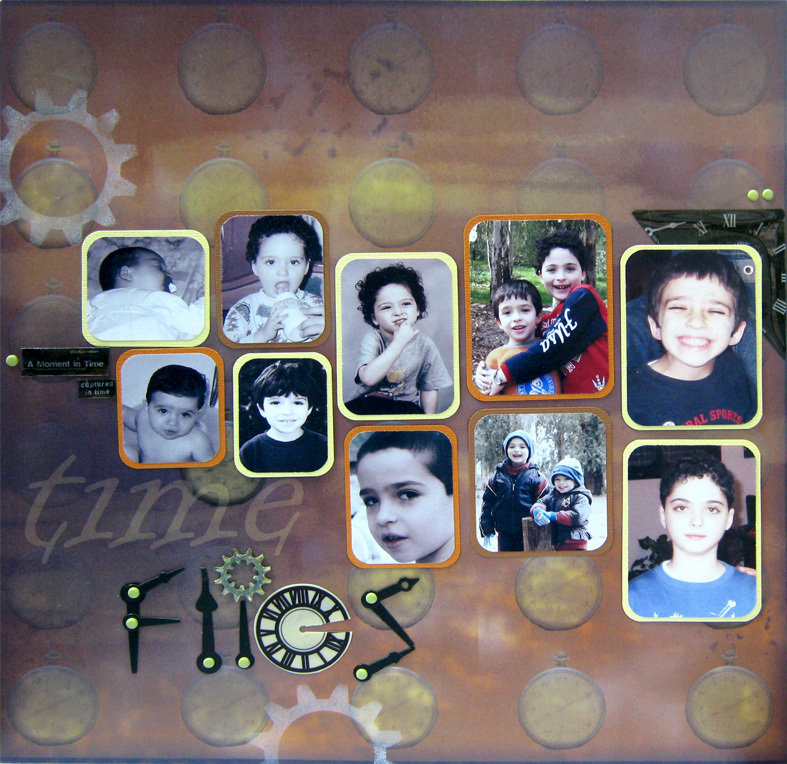 I used Maya Road Sheers – Clocks accents. 2. Cut a small triangular piece from one medium size clock to form the letter E.
3. Use a metal cog wheel to create the dot above the I. you can find really cool and cheap metal cog wheels at your local hardware store. Try to add creative titles to your layouts! נהדר!! העבודה הכי יפה שלך!!! תגידי לי עינת: איך כל דבר שאת נוגעת בו יוצא כל כך יפה??? כל כך מיוחד??? וכל כך מעורר קנאה??? שמחתי לפגוש אותך בסדנא אתמול, היה מעשיר, כייפי ומהנה.